Report of the committee [of the common council] on a free city hospital. With photograph of grounds and plans of building. City Doc. No. 34. Boston City Hospital. Bryant, Gridley James Fox, 1816-1899. Boston : J. E. Farwell & Co., 1861. Description : -31 p., [1 l.] pl., 3 plans ; ill.: 1 phot., 2 engr. (fold. ), 1 lith. (fold.) ; 23.7 cm. Photograph : one albumen mounted on card stock. Subject : Hospitals — Design and construction. Author caption: THE Joint Standing Committee on the Free City Hospital, would submit the following REPORT. Author caption: Respectfully submitted, GRIDLEY J. F. BRYANT. Google maps view from 120 East Concord St., Boston. Rare, copies located at Massachusetts Historical Society and the Library of Congress. Provenance: Samuel F. McCleary, Jr. (1822-1901). Boston was ill prepared for the cholera epidemic of 1847, exacerbated by a large influx of Irish famine refugees. In response, a joint committee of doctors and aldermen formed to petition for the construction of a public hospital to serve the working poor. The committee was chaired by Thomas C. Amory Jr. (1812-89), an alderman and attorney who had graduated from Harvard in 1830. It took 14 years of political maneuvering before a request for architectural designs could be advertised with a prize of three hundred dollars. Gridley J. F. Bryant's design won first place and an award of two hundred dollars, but he was required to eliminate two of the six pavilion structures and to heighten the remaining four pavilions with mansard roofs, fitted with dormer windows. 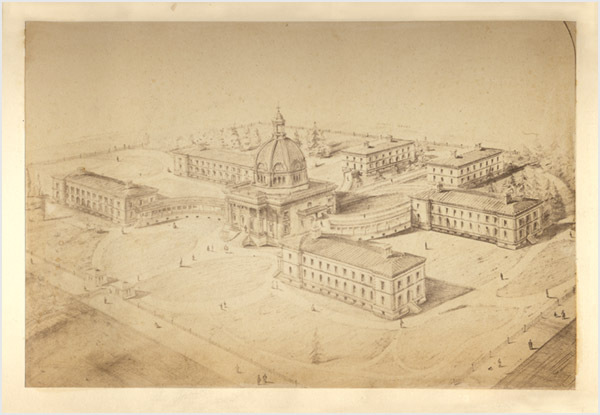 Bryant also changed the look of the magnificent domed administration building to more closely resemble Hôpital Les Invalides in Paris. A large portion of the funds for the project was bequeathed by a Boston produce merchant, Elisha Goodnow, who was the second patient to be admitted to Massachusetts General Hospital when it opened in September 1821—operated for stone by John Collins Warren. It was said that through Dr. Warren's merciful care, a small urinary stone was consecrated to become the cornerstone of the great Boston City Hospital.